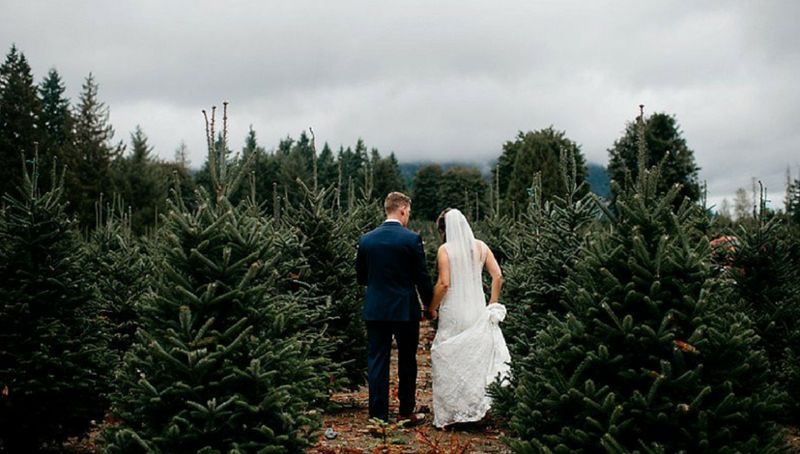 Moody grey skies and tall pine trees are hallmarks of Pacific Northwest weddings. We love how this wedding showcases the alluring scenery of the area. Set in the dramatic background only nature can provide, this wedding gives perfect inspiration for holiday fêtes and wintery weddings. 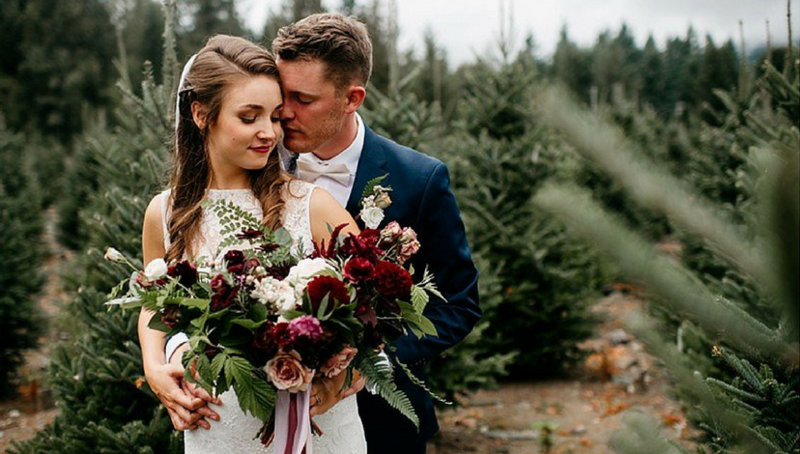 This stunning ceremony at Trinity Tree Farm outside Seattle, Washington seems like the quintessential Pacific Northwest wedding. 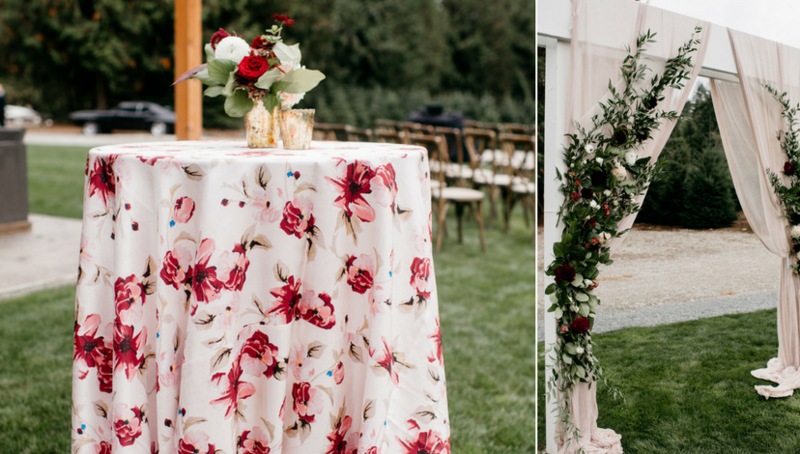 From the gauzy archway adorned with deep burgundy, soft peach, and rich greenery to the luscious natural pine background–the ceremony design was a feast for the eyes. The Abigail Floral Shantung on highboys added a soft touch with the perfect colors to complement the natural floral. The private moments between the bride and groom nestled among the pine trees seems like a secret encounter deep in the woods. 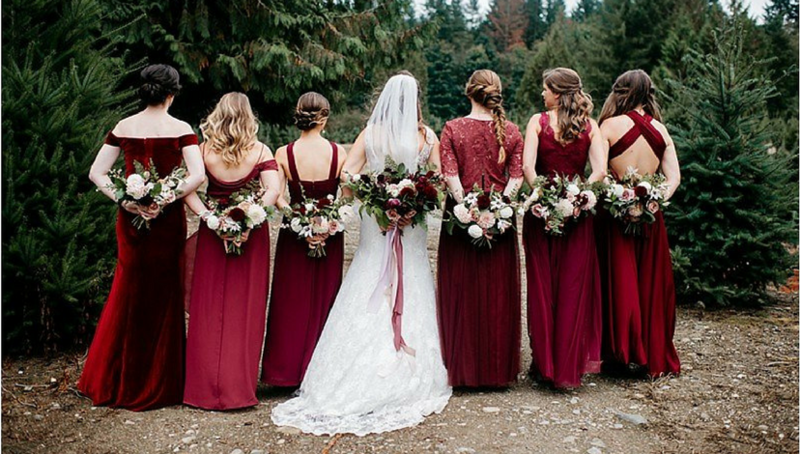 The rich scarlet bridesmaid dresses offer a vibrant contrast to the varied evergreen shades. 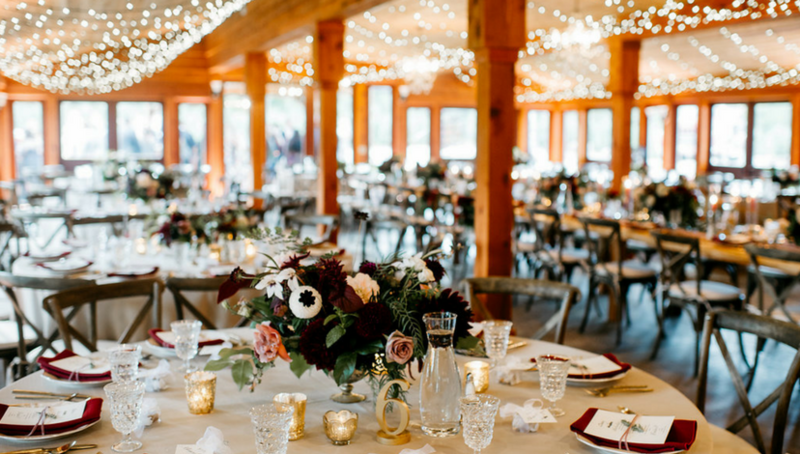 Following the touching ceremony officiated by the bride’s uncle, guests entered the barn, where hundreds of twinkling lights added a cozy flair to the rustic space. Wedding designer, Erika Hernandez of the Greatest Adventure Weddings & Elopements, “wanted to brighten up the room with a lighter table linen, but the Scarlet Yuma napkins were the perfect pop of color and complemented the flowers so nicely.” The farm tables fit perfectly with the venue and the loose organic floral was a natural complement. The details, while sometimes overlooked, are the special touches that really bring events together. This couple missed no steps by taking cues from the beauty of nature. The pine tree watercolor envelope liner and pine motif on the invitation set the tone for the celebration. 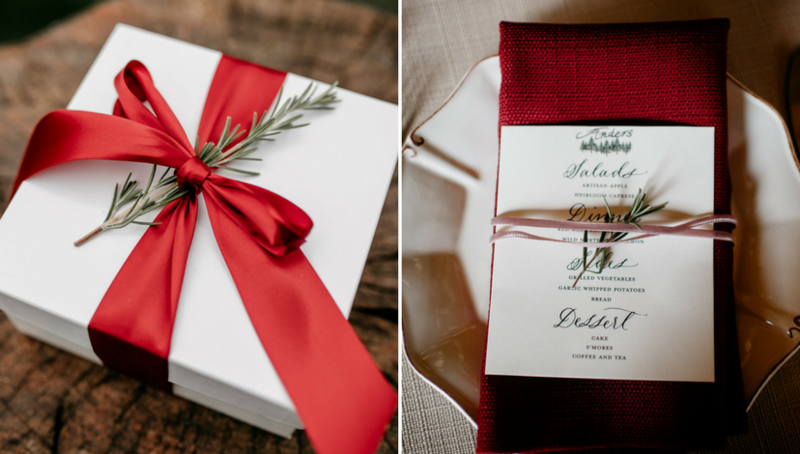 The sprigs of rosemary at each place setting and the repetition of the invitation’s pine tree motif on the menu card pulled the outdoors into this warm mountain barn. 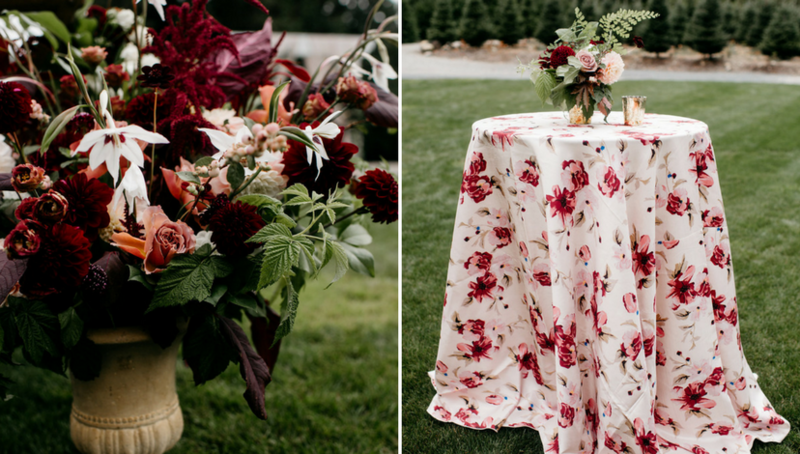 The rich scarlet tone tied the everything together as the main floral color, bridesmaid dresses, and chic gifts the bride and groom exchanged. 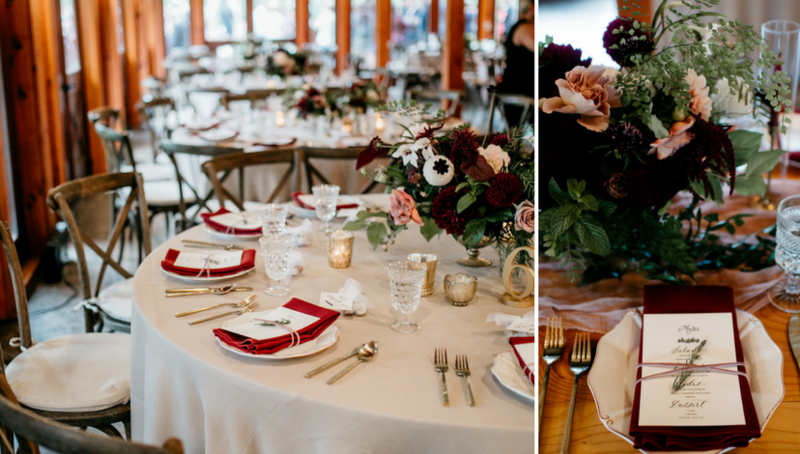 We love how nature played a part in every element of this wedding; from the invitations, to the highboys, and napkin selection. 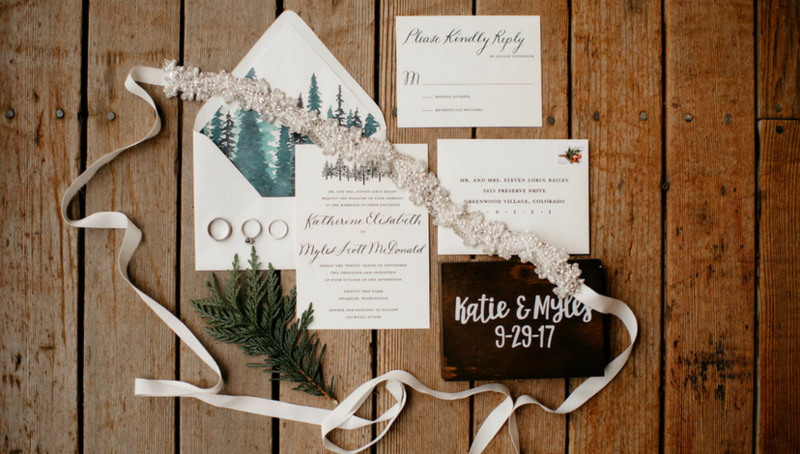 The twinkling lights and pine trees paired with a rustic wooden setting inspires holiday and wintery celebrations. Wedding designer, Erika Hernandez, says that, “they were the dream couple to work with–laid back. They let us put together a dream team of vendors. They completely let go and put their trust in us.” We think she nailed it!